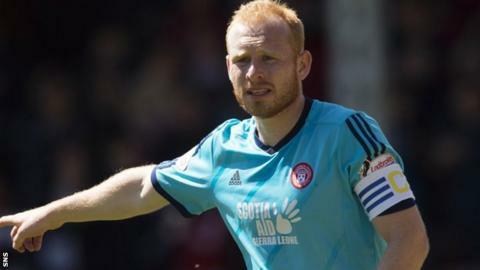 Ziggy Gordon admitted he was "gutted" not to sign off from Hamilton Academical with a late winning goal as he mulls over his future. The full-back announced this week he would leave the club this summer. Gordon could have clinched victory for his side in the 2-2 draw with Partick Thistle, but blazed over from point-blank range in the final minute. "It wasn't to be," he said with a smile. "I'm a wee bit gutted I didn't score but it didn't spoil my day." Gordon has been linked with a move to Dundee, whose own right-back Paul McGinn is tipped to move on. But he told BBC Scotland: "I'm going on holiday on Tuesday. I've been working very hard so I think it's time to relax and look at my options." Having played at New Douglas Park from under-10s level, Gordon went on to make more than 150 first-team appearances and acknowledged that the decision to leave had not been one he took lightly. Nonetheless, he added: "I'm ambitious. I'm a boy who wants to do well for himself and for his family and I feel that this is the right step to take at the right time. "I knew it was going to be a difficult day - to play in the game and stay focused - but the reception I got at the end was all worth it." Though he departs, Gordon - another product of Accies' much-lauded youth system - maintains the club can continue to "punch above our weight" and continue to produce talented young players. "I think today I was third eldest and I just turned 23 last month," he added. "It epitomises how well the club is run and they're willing to give people chances because we don't have the big budgets to get in foreign players or players who have already been proven as a certain calibre. I'm indebted to the club because I wouldn't be here if that wasn't the case. "I've got absolutely no doubt that Hamilton, if anything, will do even better next season. "The gaffer's first full season in charge was always going to be difficult but now he's wiser, the players are wiser, we've got a good young crop coming through who are just so eager and hungry to do well. I've no doubt Hamilton are in great hands." His manager Martin Canning admitted it would have been fitting had Gordon scored a late winner as he acknowledged the role he had played in the team again preserving their Premiership status. "He's a great guy, fully committed and I would've loved for him to get a last-minute winner in his last game. It would've been pretty special. "But we wish him all the best. He's been fantastic for the club and he's served us well." Canning said Michael McGovern, the Northern Ireland goalkeeper, was "keeping his options open" with his contract about to expire, while he hoped to fend off any potential interest in Ali Crawford, another of Accies' young stars.